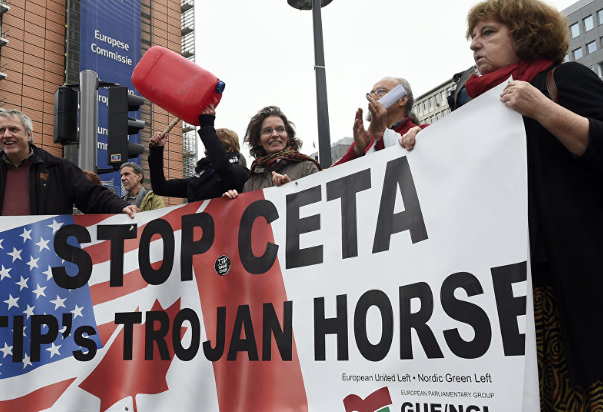 By TruePublica Editor: Not very high on the list of important stuff to report by the mainstream media was the fact that Parliament passed the Comprehensive Economic and Trade Agreement (CETA) between Canada and the EU by a vote of 315 to 36 last week. The Labour Party abstained. Well done them. It appears they like abstaining or hiding from some of the most important economic decisions the country faces – not least Brexit. Quite bizarrely, those with some idea of the thinking behind Labour’s justification of abstaining was on the grounds that Labour is on the one-hand pro-trade but on the other, had reservations about the deal. They think they can renegotiate these deals in government. They aren’t in government and might not be next time around. And even if they are – does Labour really think the country would want to see all 41 trade agreements renegotiated after the first round of chaotic negotiations by Theresa May’s mob of undecided that drained the patience of everyone for god knows how many years to come? I don’t think so. The statement calling on MPs to vote against the deal has been signed by UNISON, GMB, Friends of the Earth, SumOfUs, Global Justice Now, Trade Justice Movement, Trade Justice Scotland, Banana Link, Labour Behind the Label, National Justice & Peace Network and War on Want. The result? All those things their friends warned would happen – will now happen! Probably. As for Brexit – there are lots of calls to “get on with it” – but neither Labour nor the Conservatives have quite decided what ‘IT’ should look like. Should it fundamentally be an exercise in damage limitation or what some might think is an attempt to redraw Britain’s role in the world? Like many, I’m still scratching my head on this one and think both parties have no real idea what they are doing – still.